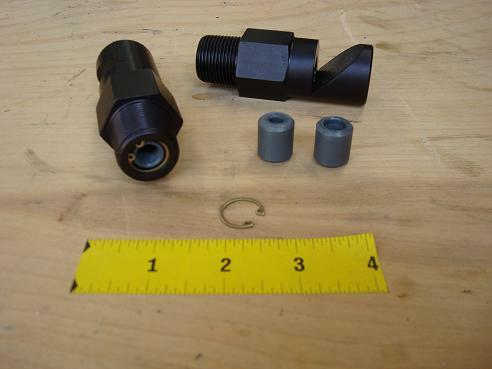 Specs: 3/4" Male NPT Tapered thread. Note use Teflon tape on threads. Gives about 180 degree pattern, with 15 foot / 5 meter radius. At 60 PSI / 4 BAR, the 1/4 inch / 6.5mm orifice flows approximately 14.7 GPM / 55 liters per minute, the 3/8" / 9,5mm orifice flows about 21 GPM / 80 Liters per minute. With no insert, 9/16" /14mm, it flows 72 GPM / 272 Liters per Minute. NOTE: high pressure gives smaller drops, lower pressure gives bigger drops. Be diplomatic with the cameraman, but you must look through the camera at the rain yourself to make sure that it does not cross itself and that it is BACKLIT. Rain must be lighted from behind to be seen. If the rain crosses itself, adjust or raise your rain towers or rainbars. Try to have rain in the foreground in front of the camera; this will help hide any gaps in the background rain.